Salesforce has forecast current-quarter profit below analysts' estimates, as the cloud-software maker invests heavily to boost sales and fend off rising competition. The San Francisco-based vendor has been reaping the benefits of a trend of companies increasingly turning to cloud-based services, but faces stiff competition from Microsoft's Dynamics 365, which competes with Salesforce's flagship Sales Cloud offering, and from Oracle. Asked about the company’s forecast for the third quarter, CFO Mark Hawkins highlighted the company’s US$21 billion in remaining performance obligation, which represents future revenue under contract that has not yet been recognised - that figure was up 36 per cent year-to-year. The company forecast third-quarter profit between 49 cents and 50 cents per share, and revenue of US$3.36 billion to US$3.37 billion. Analysts on average were expecting a profit of 54 cents and revenue of US$3.35 billion, according to Thomson Reuters - the company's shares fell more than three per cent in trading after the bell. “Investors want to see two things: more growth and how they are going to handle increased competition," said Adam Sarhan, CEO of 50 Park Investments, an investment advisory service. Salesforce has been boosting its research and development expenditures, as well as marketing and sales, increasing its operating expenses 27 per cent to US$2.32 billion in the second quarter. Revenue from its flagship product, Sales Cloud, rose 12.7 per cent to US$1 billion, a record for a quarter. The company's unearned revenue, a key metric used to measure future business for subscription-based software vendors, rose 24 per cent to US$5.88 billion. Analysts on average expected US$5.91 billion, according to financial and data analytics firm FactSet. Salesforce posted revenue of US$3.28 billion for the second quarter, up 27 per cent from US$2.58 billion a year ago - that beat analysts’ estimates of US$3.23 billion. 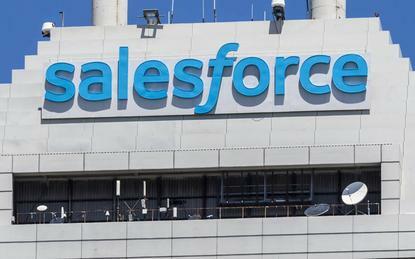 Salesforce accounted for about 20 per cent of the 2017 global customer relationship management software market, up from 18.1 per cent in 2016, according to research firm IDC. Oracle is the company's closest rival with 7.1 per cent while Germany's SAP is next with 6.5 per cent. Microsoft's Dynamics enterprise software is also emerging as a major competitor after nearly tripling its market share to four per cent in 2017. "We're in an enviable position right now as the market leader,” said Keith Block, the company's long-time COO who was named co-CEO earlier this month. Net income rose to US$299 million, or 39 cents per share, in the second quarter ended July 31, from US$46 million, or six cents per share, a year earlier. Analysts on average were expecting a profit of 47 cents per share - excluding items, the company earned 71 cents per share.